DEKO 190LC (Logic Controlled) is designed and constructed to exceed the standard performance and design requirements stated in ISO EN 15883-1 Washer-disinfectors - Part 1: General requirements and Part 3: Requirements and tests for washer-disinfectors employing thermal disinfection for human waste containers, together with, the Safety requirements stated in IEC 61010-2-040: Particular requirements for washer-disinfectors used in medical, pharmaceutical, veterinary and laboratory fields. •	water pressure for washing is supplied by a high powered 600L/min recirculation pump. •	detergent is dosed into the re-circulated wash water by a pump. The unique working principle facilitates cleaning and steam disinfection of the entire system including wash chamber, water tank and outlet with the minimum usage of water and energy. •	the disinfecting steam is generated by an integrated unpressurised boiler and run through the water tank, outlet and internal pipework. •	wide selection of disinfection temperatures and cycle setups to secure the microbial inactivation impact.. Cycles can be altered to meet almost any special requirement, though the standard requirements are met with the fixed, tested and approved cycles pre-programmed by the manufacturer. The 3-level access code system protects any unauthorized changes to the set parameters. Automatic Non-Touch door, a user-friendly, state-of-art color Touch Screen control panel and printer are available as options. The washing spray patterns are delivered through 3 rotating + 7 fixed spray jets guaranteeing contact with all surfaces and crevices of items with varying design. 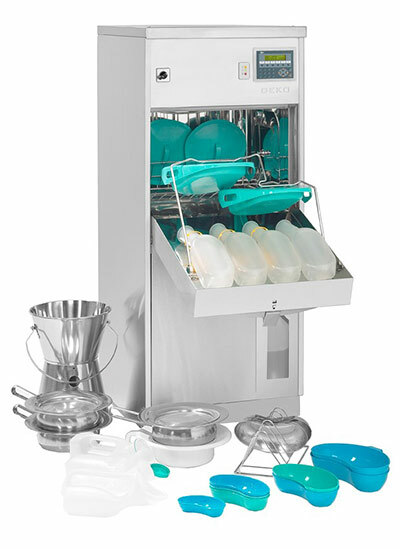 The DEKO 190 LC has a large wash chamber with the capacity for the automatic emptying and processing of 2 bedpans with lids and 4 urine bottles simultaneously.